Green sea urchin is caught on both Atlantic and Pacific coasts of Canada. Total green sea urchin production peaked in the late 90s with 4 million t/yr, and has since declined, to around 2.5 million t/yr, with the largest landings from New Brunswick. 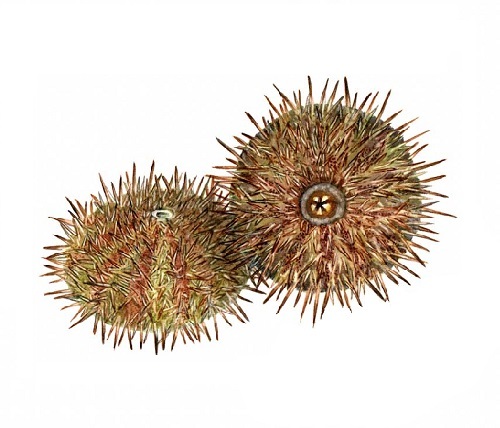 Canadian production of both green and red sea urchins represents 5-9% of global production in the past decade, and is the largest source of urchin imports (over 80%) to the US market. Green sea urchins caught by divers are Recommended due to their moderate impacts on stock (low in BC), minimal impacts on other species and minimal habitat impacts. On the Atlantic coast stock status is a moderate concern, with abundance and mortality rates both unknown. In BC, assessments indicate the stock is healthy and mortality rates are below a sustainable level. There are no bycatch or habitat impacts for dive caught urchins. Management is rated ineffective in Newfoundland and Labrador, Nova Scotia and New Brunswick, due to a lack of appropriate monitoring measures and controls on fishing levels. However, in BC and Quebec, management measures are in place and are expected to be effective. Removing urchins can lead to significant ecosystem changes and few measures are in place to minimize harmful impacts. Red sea urchin production on the Pacific west coast has remained relatively stable since 2005, fluctuating around 12,000 t/yr. Most of that production is from California (~5,500 t/yr), followed by BC and Mexico (Mexico not assessed here). This is much less than a peak in the late 1980s, when California alone was producing over 20,000 t/yr. Most is exported to Asia, although domestic consumption has increased recently. Red sea urchin caught by divers is Recommended due to high scores in all criteria. Stock status is likely healthy in Washington and Oregon, and though unknown in BC, Alaska and California, overfishing is unlikely. In BC, Alaska and Washington, management is highly effective, with conservation measures based on scientific advice, while in California and Oregon, there are management measures in place, though effectiveness is unknown. Diving has no bycatch impacts and does not damage habitat. However, removing urchins can lead to significant ecosystem changes and the measures in place to reduce impacts have not been studied. Landings of green sea urchin in the Maine comprise 98% of US landings. Catches have decreased significantly since a peak of almost 20,000 t in 1993, currently averaging around 1,000 t annually since 2005. Most is exported to Asia, although domestic consumption has increased in recent years. Green sea urchin in Maine is Not Recommended for all gear types due to high concern over abundance and management, and, in the dredge fishery, impacts on other species and the ecosystem. The stock is overfished, and management measures to control fishing levels have not been effective at rebuilding stocks. Diving and hand implements have no bycatch or habitat impacts, but observer data show high discard rates of undersized and poor-quality urchins in the dredge fishery, with unknown survival rates. Removing urchins can lead to significant ecosystem changes and few measures are in place to minimize harmful impacts. Sea Urchins are fished in coastal North America, primarily for their eggs or sperm, called ‘roe.’ Japan exports more than 80% of the world’s sea urchin roe. In the Pacific Ocean, sea urchins can be found from California to Alaska in the intertidal and subtidal zones. Sea urchins are currently fished in northern and southern California, but not in central California due to sea otter predation. Following an extensive expansion in the fishery in 1985, major population declines were observed. Currently, the California Department of Fish and Game (CDFG) has declared that the fishery is being fully exploited and certain areas may be overfished. Red sea urchins tend are very long-living, up to 100 years old. This species reaches sexual maturity after 5 years, and harvestable size (3.5 inches) after six to eight years. Populations are known to fluctuate with oceanographic processes such as El Niño events. Red sea urchins have a high reproductive potential as they release several million eggs in a single spawning event, making them relatively resilient to fishing pressures. However, overfishing in California has caused significant population declines and stock status to be of high concern. The California Department of Fish and Game (CDFG) currently manages the sea urchin fishery, though no formal management system exists. California currently does not use quotas or other enforcement measures. The management system allowed substantial stock declines and has not been effective in the stock’s recovery. Dive-fisheries have high selectivity; bycatch of other species is very low in this fishery. Sea urchins are an important species in the kelp forest ecosystem. Their removal reduces herbivore pressure on kelps, causing a phase shift and allowing the establishment of kelp-dominated stable systems.